These flexible furnishings will lift, shift, glide, and transform before your very eyes. If you’re living in a small space, one way to deal with the challenge of limited square footage is to select furniture that transforms or pulls double duty—for instance, a sofa that turns into a bed, a table that folds into itself, or even a bed that lifts into the ceiling! We've rounded up our top kinetic furnishings that transform with a simple push, pull, or press of a button. 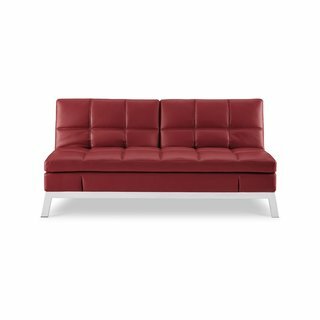 The Gjemeni couch can serve as a sofa, a chaise, a bed, and more. 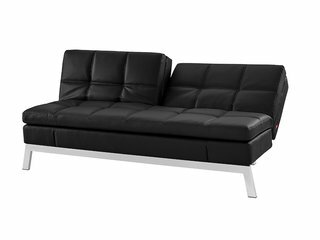 Coddle's Gjemeni couch is capable of over twelve different positions, ranging from a traditional armless sofa, to a lounge, to a full-on bed. It's made of stain-resistant leather and features four USB ports and two 110-volt sockets, so you'll never need to get up for anything—aside from a snack! The piece comes in four different colors, requires no tools for setup, and it's relatively affordably priced at $999. From Day Bed To Dream Bed: The No-Compromise Convertible Most convertibles sacrifice comfort for convenience. Not Coddle. It turns into a bed in seconds – and the moment you stretch out you’ll see we’re built for sleep. But if we’re going to be your every night bed, we recommend our 3” topper. The chair is created by Taiwanese duo: Hung-Ming Chen and Chen-Yen Wei, also known as Afteroom. Operating from their Stockholm-based design studio their inspiration derives from an intriguing interest of forms, senses, proportions, materials and cultures. The hexagonal sections of the Lift-Bit can be raised or lowered in a matter of seconds through the associated app. Designed by Carlo Ratti Associati and Opendot, the Lift-Bit is a shape-shifting furnishing composed of a series of motorized hexagonal cushions. 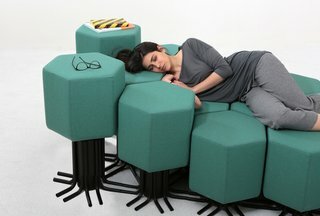 The cushions can be raised or lowered into endless configurations using a phone app, so the Lift-Bit can serve as a sofa, chair, chaise lounge, group hangout area, or just about anything else you can think of. This collapsible honeycomb structure looks like the silhouette of a chair when it's folded—but give it a little tug, and you'll suddenly find yourself with seating for eight. 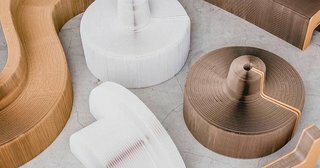 The FlexibleLove chair is made of eco-friendly kraft paper, which allows for great strength, flexibility, extension, and curvature into unique and unexpected shapes. Pricing for the seating starts at $395. The Ori Cloud Bed fits perfectly into the wooden baffles of the canopy above. The back cushions of the sofa turn into a headboard when the bed is lowered. You're probably familiar with traditional Murphy beds, which flip up into a wall-mounted cabinet. The Ori Cloud Bed takes the concept to new heights—instead of flipping into the wall, the bed flies into the ceiling, revealing a sofa and coffee table in its place. The bed fits into a void in a wood frame in the ceiling, giving the appearance of a canopy overhead rather than the weighty presence of a bed. The Rising Table by Robert Van Embricqs transforms from a flat, almost two-dimensional surface into a three-dimensional table with a sculptural form. The Rising Table by Robert Van Embricqs leaps from a flat surface into a thoughtfully-designed table. Made of Plyboo, a type of bamboo plywood, the beams of the table cross each other to form a visually stunning, complex woven pattern. 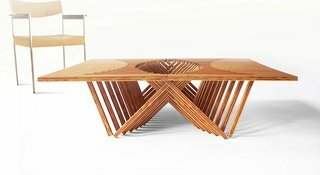 The interlaced beams form the Rising Table’s legs, and the design can be set at different heights to serve as a coffee table or a dining table. The De-dimension collection comes in two different sizes and three different colors, all of which are made of aluminum and collapse flat. Inspired by two-dimensional axonometric drawings, South Korean designer Jongha Choi created an aluminum stool and table that, when pushed and tilted at a certain angle, collapse into what looks like a two-dimensional form. Once flattened, the pieces can be easily stored—or even better, hung on the wall like art, ready to pop up and come alive when needed! 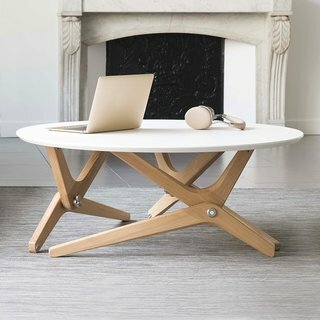 France–based Boulon Blanc has developed a patented technology that transforms a low-slung coffee table into a regular-height table with a simple pull. 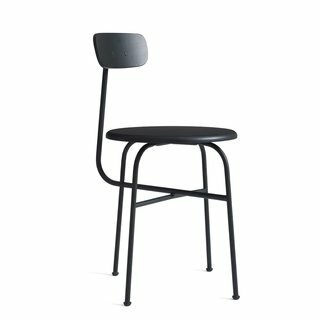 The horizontally-oriented legs flip up to a taller height so that the design can serve as a little kitchen table or a larger dining table, depending on the size. The company's transforming tables and stools are available in a range of sizes and materials, but all have solid wood legs and are made in France. Ori's Pocket Closet is installed on a robotic rail. It opens and closes using a built-in controller, a smartphone, or voice control. If your tiny apartment lacks storage, look no further than the Pocket Closet by Ori. The system essentially consists a series of shelves attached to tracks along the wall. 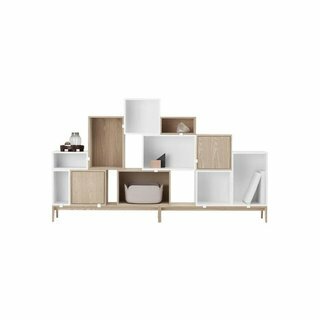 The shelving units glide back and forth along the tracks, taking up a tiny amount of space but opening up to the size of a walk-in closet. 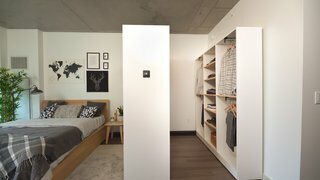 The storage wall can be moved with the touch of a button, or with a voice command to Alexa or Google Home devices.